This memory for 81 Layer Bisquits comes from my pal Travis. Frank: So Travis, what is your food memory you want to share? Travis: I grew up in the mountains of North Carolina, and when I think of food memories, one food comes to mind immediately: biscuits. My mother always made fresh biscuits with every meal. We never had biscuits out of a can. F: So you mean you never cheated and used a can? or those frozen bagged ones? T: Yes.. I know.. ok so back to Bisquits.. Several decades later, I still like playing with dough. I often try different recipes. 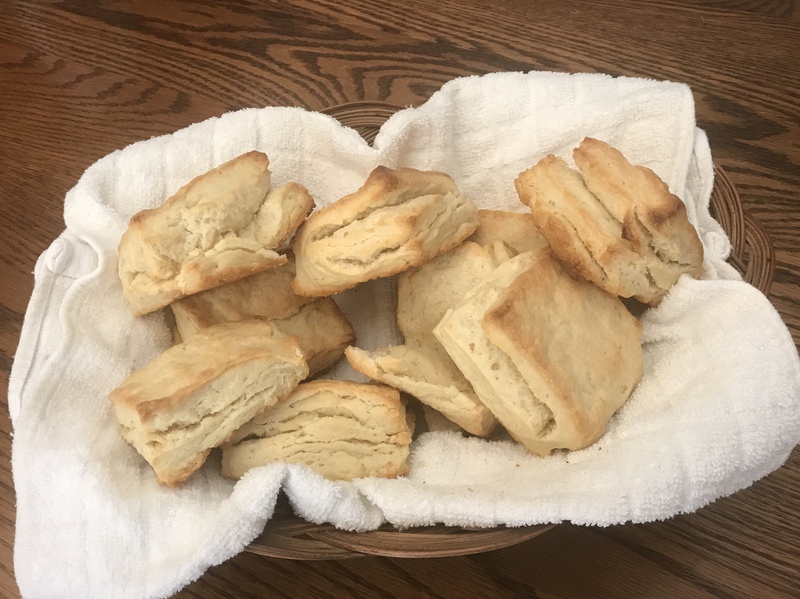 Like many other home and self-taught bakers, at some piont I decided to alter a recipe for biscuits that had become my “go to favorites”. My goal was to see what woudl happen if I added a variation of a flaky pastry technique called lamination. F: Is that the one that you layer butter between dough for what seems like forever and role it out? T: Pretty much. If you’ve ever made homemade croissants or puff pastry, you’ll have used this trick. Lamination creates layers of butter in a pastry so that it will “puff” in the oven and give unparalleled rise to dough. If you’ve never laminated dough before, this is a really simple process and the result is so gratifying. T: Sure did. This variation of biscuits have layer upon layer of flaky deliciousness and are perfect paired with any of the classics: tomato biscuit, sausage biscuit, gravy biscuit, ham biscuit, fried chicken biscuit or just the simple perfection of some homemade honey butter. Honestly, I had two of these babies today with nothing on them at all. I hope you enjoy these as much as I did. Fair warning, they’re slightly addictive. In large bowl, whisk the AP (All Purpose) Flour, Sugar, Baking Powder & Salt together ’til well combined. Knead in the bowl for about 30 seconds. 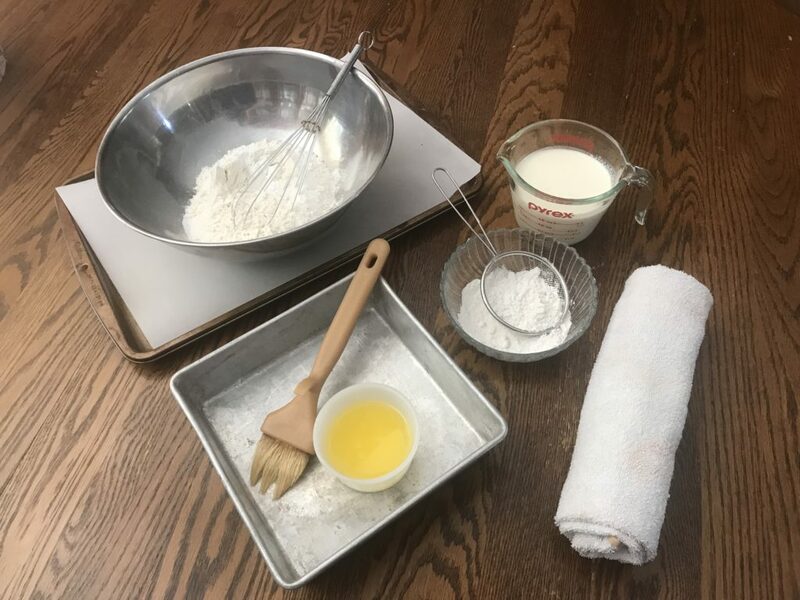 Lay out a tea towel and dust heavily with SR (Self Rising) Flour. Brush the top of dough with the melted Butter and sift a layer of SF (Self Rising) Flour on top of the butter. Fold into thirds by taking the bottom third of the dough and turn it onto the middle, then pull down the top third down to create 3 layers, exactly as you would fold a piece of paper to place in a legal envelope. Press out (or roll out) the dough into a rectangle again & rotate 180 degrees. Repeat this step 3 more times, remember to brush with Butter & sift with SF (Self Rising) Flour before folding. In all total you will end up with 81 fold. (First fold creates 3 layers, second fold creates 9, then 27 & finally 81 with fourth fold). 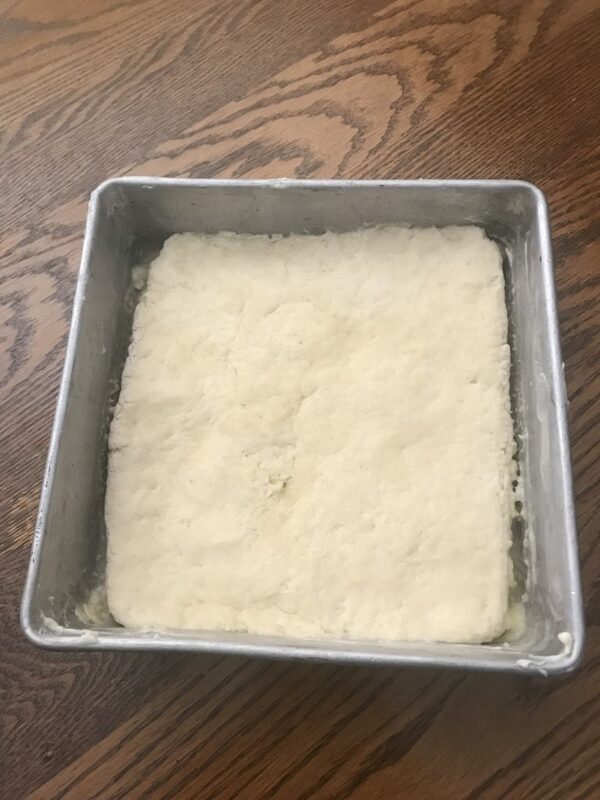 Heavily butter an 8×8” baking pan and press dough into pan in an even layer. Cool in refrigerator for 2 to 3 hours. Turn dough out upside down onto wax paper. Using a very sharp knife, cut 9 squares with single quick press through the dough, this will ensure a nice rise. Place onto baking sheet lined with parchment paper, roughly 1 ½” apart. Bake approx. 15-18 minutes rotating pan halfway through cooking. In case some of you have never done the layered dough/butter combination – I found a few youtube videos that will illustrate the different techniques – but in the end, get your hands in it and try for yourself! This entry was posted in Food Memories, Food Memories Stories Told 2017 and tagged Bisquits, Foodmemories17. Bookmark the permalink. ← Get Your Food Storytelling & Memories Ready To Share!